It’s a rare occurrence that we see something for the first time and we feel we have to buy it at that moment. 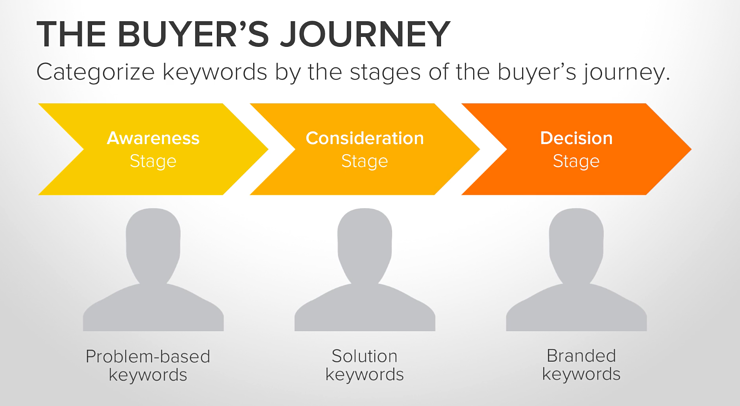 In more normal cases, we pass through a sales funnel that is called a buyer’s journey, and we pass through several stages before becoming a customer. We first interact with the brand or product a few times, become familiar with it, realize it matches or fulfills our need, evaluate it and seek convincing reasons to buy, and then become a customer. Corresponding to this, the pain point of every content marketer is selecting topics that will resonate with the audience and engage them at each stage of their journey. Since marketing became more digital, it has been easier to track and engage with prospects, which is precisely why 89% of B2B marketers use content marketing, up from previous years’ rates of 88% and 86%. However, those who find content marketing very effective remain at around 35%. With some research, it’s easy to discover that the main reason behind this challenge is the failure to create a perfect balance between right content, right audience and right time. If you want to read more about this, you can check out The Three Pillars of Inbound Marketing. Inbound marketing and sales are customer-centric; that’s why you need to know who your target group is. You don’t want just any traffic to your site, you want the right traffic. You want to attract people who are most likely to become leads, and, in the end, happy customers. Buyer personas describe your ideal customers. A buyer persona is a semi-fictional representation of an ideal customer, based on real data and some educated speculation about demographics, behaviors, motivations and goals. Why buyer personas matter to every business? We focused on this topic in different article — check it out if you want to create buyer personas for yourself. Let’s go through each stage following an example: Mary’s fridge is making a strange buzzing sound. This is the stage where the potential customer first becomes aware of a problem or challenge. Mary noticed the noise and went online to find the possible cause. The best content for this stage helps define the problem and presents possible solutions, like a blog post about things that could cause your fridge to buzz. Your content must be relevant and informative and shouldn’t talk about your company or services at this point. Offer free eBooks and guides or educational videos, or write helpful blog posts. At this stage, people are considering the best solution for their problem. Mary learned that the noise was caused by the fan motor, which needs replacing. If you sell fridge parts, write a DIY how-to for replacing the motor or make a video guide. If you offer repair services, talk about the risks of repairing the fridge on your own, or emphasize that it takes longer for an amateur to make the repair. Now the prospects have chosen a solution and they’re looking for the best provider. Mary decided not to meddle with the fridge on her own and to call a repair service. It’s time to talk about your company and what makes it stand out — fast service, longer warranties, affordable prices, or anything else. Flaunt customer success stories, offer free trials, give the buyers a nudge in your direction. Now that you know how to tailor your content to each step of the buyer’s journey, you have to pick the best way to publish and promote it. 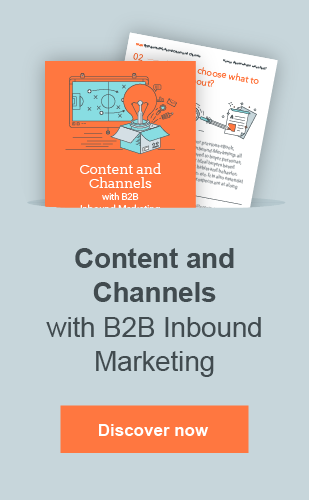 Check out our B2B Inbound Marketing Content and Channels free eBook to learn more! 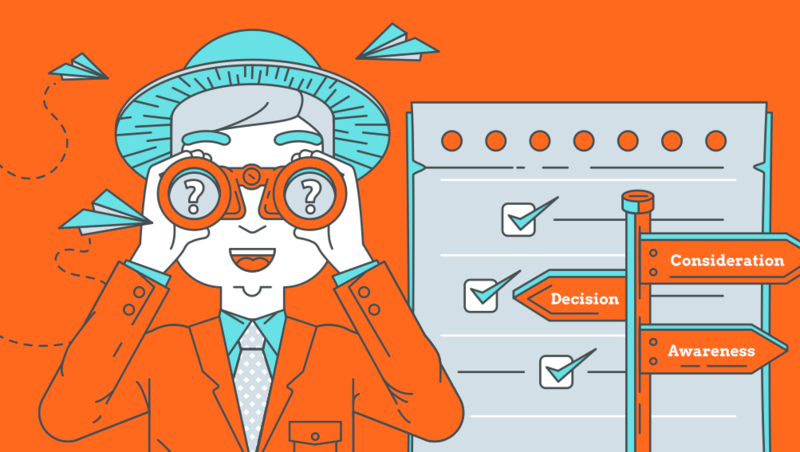 Now, when you have your buyer personas and you know their buying journey, it’s time to do inbound marketing. Inbound marketing can’t exist without remarkable, tailored content! Good content has to be grounded in the correct context. It needs to be tailored to who you’re trying to reach (your persona) and what they’re most interested in seeing (which depends on where they are in the buyer’s journey). The context means who you’re creating it for. The audience wants to read about things that they’re most interested in! For more information about creating remarkable content, download our free e-book. Once you’ve created piece of content, how to distribute it? How to use your social channels to do this properly? Make your content is available for your buyer personas to find. Content distribution is what provides the context to your content. It’s not enough to just have great content. You need to have a way to get that content out to the people who match your buyer persona! You can read more about the distribution of content in our latest blog post! And that brings us to the end of the inbound best practices. Remember: create your buyer personas and try to “walk in their shoes” to find out what problems they are facing (to know the context), how they make decisions (to map the buyer’s journey), and what channel they are using (to know where to distribute your content).